NEW BRITAIN – The city now has a new taste of Mexico right on West Main Street. Taqueria La Grande opened its doors on May 5 – Cinco de Mayo. Owner, Antonia Trejo, said she has years of experience in the restaurant business. “I have always worked in restaurants, in different restaurants – American, Mexican, my mother-in-law has a restaurant, in the city of Hartford, so I have worked with her too,” Trejo told The Herald on Tuesday. 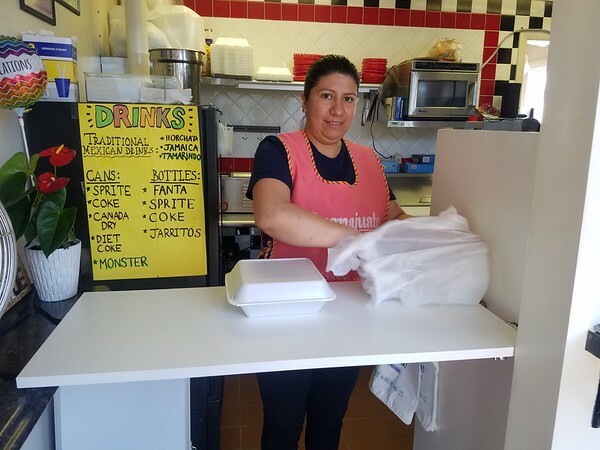 Trejo said opening Taqueria La Grande, located at 985 West Main St., was a challenge because this is the first time she and her husband have owned a business. “It’s exiting, but at the same time, I’m a little bit nervous, we are willing to make it successful,” she said. Trejo relocated to the U.S. from Mexico 20 years ago, and lives in Hartford. She has two sons. The oldest will be starting college in the fall. She said this is the reason she decided to open her own restaurant now in order to increase her income. Trejo said that even though her restaurant isn’t a fast food eatery,, she wants it to be a place where people can grab a quick bite, perhaps during lunch breaks. She said she wanted to offer a menu that had a variety of flavorful dishes at a reasonable price. Adding that her speciality is Taquitos - a smaller version of normal tacos. The restaurant offers traditional Mexican dishes including: burritos, enchiladas, quesadillas, tortas, tamales, nachos, and flautas. Downtown District Executive Director, Gerry Amodio, said the new restaurant is a great addition to the city. “I think it’s wonderful, we love to have different types of food in town,” Amodio said. Amodio said he appreciates Trejo’s concept of running a restaurant where customers can get a quick bite to eat without spending a lot of money. “You have to be in and out, if you want to have lunch, you have to move fast,” Amodio said. Gilberto Recuero, a New Britain resident originally from Panama said he is happy there’s a new restaurant in the city that offers authentic Mexican cuisine. “Sometimes I eat Mexican food in restaurants in which I really can’t find the quality,” Recuero said, adding that a restaurant offering authentic Hispanic dishes with fresh ingredients is great to have in New Britain. 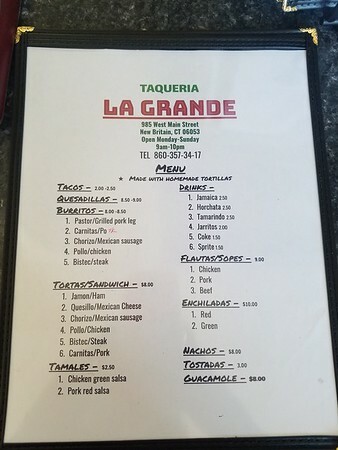 Taqueria La Grande is open Monday to Sunday from 9 a.m. to 10 p.m.
Posted in New Britain Herald, Business, New Britain on Friday, 18 May 2018 14:55. Updated: Friday, 18 May 2018 14:57.